Jammu, Sep 4 (KNO) : Peoples Democratic Party (PDP) President Mehbooba Mufti on Tuesday termed the dialogue and reconciliation between India and Pakistan inevitable for the resolution of Kashmir issue and making peace and tranquility in inseparable features of the violence infested state. Addressing general masses, party functionaries, workers and activists in Rajoori, the former Chief Minister urged the two countries to rise above the ego clashes and exhibit the political astuteness so that the dream of a peaceful and tranquil Jammu and Kashmir is realised. She further asserted that the embargo in the state wouldn’t in any way be resolved through the announcement of the economic packages but by consistent and earnest efforts aimed to get the state out of the squalid conditions and taking youth into confidence so that to stop them going adrift. “Economic packages aren’t going to resolve the issues in any way. Though the roads, bridges and electricity are vital needs of the people but until and unless there is dialogue aimed at the resolution of the conflict, no sigh of relief could be provided to the already perturbed masses,” she said in her address. PDP chief remarked that after the 2014 polls accorded fragmented mandate to state’s political landscape, PDP founder Mufti Mohammad Sayeed decided to stitch the common ground with BJP will the sole motive to reincarnate the Vajpayee era in the state and to stop the vicious cycle of unbated killings and violence with an impeccable will and determination. “Even when I told my father that the decision to join hands with the BJP has more risks than rewards and would decline party’s popularity in the state, he said he was ready to sacrifice everything including his own self if that resolves the decades old conflict,” Mehbooba said, adding that her father was confident that dialogue and reconciliation would be initiated and same measures taken during Vajpayee’s time shall be witnessed once again. “When I took over as the Chief Minister and headed the state for two years and two months, it is a fact known to all that I didn’t compromise on my stand and stood like a rock before the central government for protection of state’s special interests. If I would have shown mere laxity in my approach, BJP wouldn’t have been compelled to topple the government. They didn’t succeeded in anyway to make me barter the interests of the state for petty power and I can tell you with all certainty that I kept the honour and dignity of my people intact and alive,”Mehbooba said. 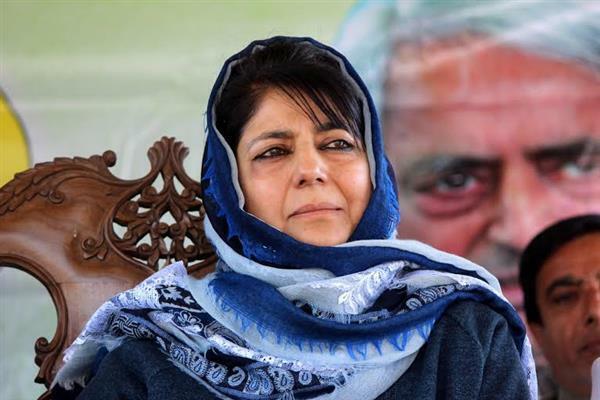 Appealing the Prime Minister Narendra Modi to extend hand of friendship to Pakistan’s new Prime Minister Imran Khan, Mehbooba said that peace in south Asia will only be possible if peace is established in the state of Jammu and Kashmir. “Opening of the new roads between the divided parts of the state and strengthening of people to people contact will lead to success. Prime Minister Modi has to pick up wherefrom late Vajpayee has left the peace process and doing so will usher a new era of development and tranquility in the two countries and people living amid constant fear can heave a sigh of relief from constant confrontations and animosities,” said the PDP chief. “I remained in the forefront as the Chief Minister to thwart any attempts aimed at the intimidation of Gujjars and Bakerwals in the state and took every measure to ensure these communities that no one is going to do any harm to them,” she said, adding that securing the secular character of the state has been the top most priority of the PDP since inception and that the party every time foiled the attempts of the fringe groups to create any communal wedge between the different religious communities living in the state with harmony and brotherhood for centuries.